For the past two years, Stephen and I have been trying our best to get in each other’s way. He is a seasoned collaborator; he understands the push pull of the process and how two creative minds can go farther out on a limb than one could ever go on their own. He also has tremendous faith in his process. He starts with a concept, brings extraordinary talents into the mix, and trusts where the process will lead. We have found many of our leanings compatible, but more interesting for me, are our differences. I have come to realize that this is really the place were we have something to offer each other. It has been challenging for me to sort out our difference artistically from our differences that stem from our respective fields. In this realm, I have learned a lot from him because the stage is a very different space than the gallery. Especially when one thinks about how the audience perceives and experiences the work. 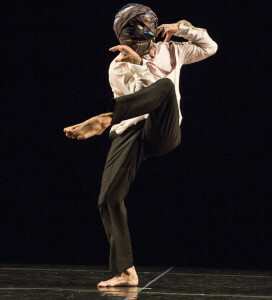 For his 30th Anniversary at the Joyce Theater, I made a “costumed intervention” for his solo, Stripped. 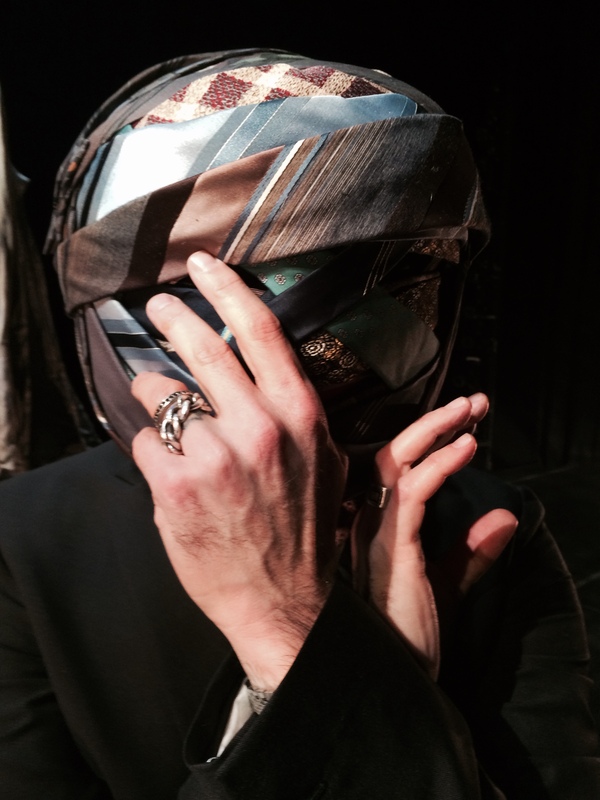 I sewed 140 feet of men’s ties end to end and wrapped them around his head to conceal his identity. The last one is tied like a traditional tie around his neck. They physically obstructed his senses and affected the quality of his movement. The initial appearance of his wrapped head is one of sad humor; his head is both concealed and inflated. Each tie tells a story and Stephen is a story maker. He is a man of large expressive gestures and he uses them to communicate his ideas with great enthusiasm. He is very Italian in that way. I like to tease him that he is just an Italian that also moves his legs. 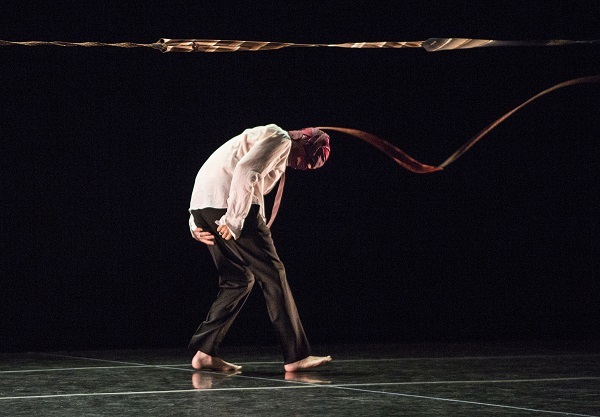 Stephen conceived of Stripped as a way to strip down to the essentials of his choreographic language. The dance is a collection of gestures. Stephen mines gestures from his past and gestures from other people. I thought of the ties as a representation of other men, or other days, another day another tie. So there is a collection of gestures and a collection of ties and an unraveling of sorts both physically and in terms of a character. As the dance and gestures unwind in a myriad of emotional states, they are enhanced by the beautifully forlorn Etude #5 by Philip Glass. 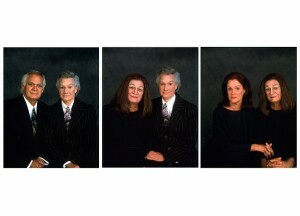 Much of my work has questioned the tradition of portraiture. 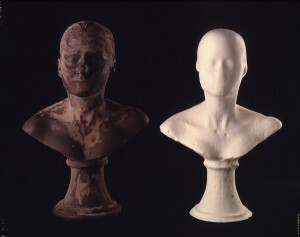 In Lick and Lather, I cast self portrait busts in chocolate and soap. I reshaped my image by licking the chocolate and washing with the soap. 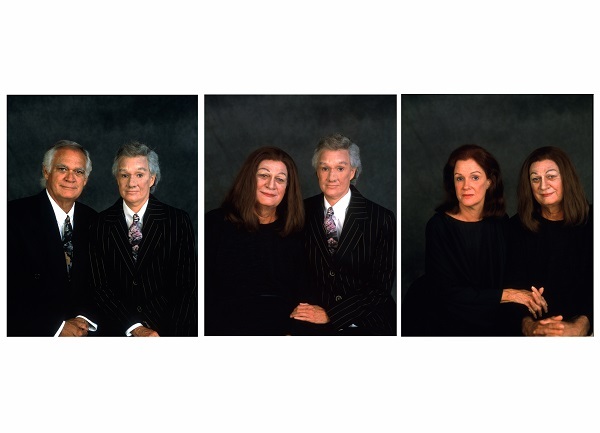 In Mom and Dad, I created a traditional photographic portrait of my parents. Using prosthetic makeup, I turned my mom into my dad and my dad into my mom. Traditionally, we locate a person’s expression in their face, particularly their eyes. Questioning this assumption, I am always erasing the face, locating identity in unsuspecting places. Arguably, a dancer’s body holds as much expression, or more, as their face. By masking Stephen’s face, I locate his expression in his body yet his bizarre bulbous head flavors those expressions. I thought of the whole scenario as a portrait of a man. The man’s tie is about surface; as a decorative accessory, it has no real purpose and is the most overt form of expression that a man has in his wardrobe. Though we start with the masculine trope of the suit and tie, a classic portrait of a man, it becomes a portrait of a particular man: over the course of the dance, the stereotype becomes specific. I wanted Stephen to unwrap, to remove his persona and expose his identity.